Hospitality is a very essential part of a wedding which most of us tend to miss out from the responsibility list and at the end moment, we try reassigning the task randomly to people available to take up the job. This is now how it should be. When a wedding is planned the guests form a very important part of it and thus taking care of their comforts and discomforts for your wedding days. It is not just necessary to ensure that invites are sent out in time, it is also important that the guests are attended right from the start, starting from the arrangement of the airport pick-up and drop, make bookings for hotels, inns, guest houses, etc. arranging for meals and snacks for the guests on the days other than the wedding days and so on. All this needs to be done to ensure the wedding goes smoothly without any glitch and no one has any reason to complain. However, handling this task might be a cumbersome job for one person. Our team at Rachnoutsav are specialized in hospitality and ensure that all these matters are taken care of right from the start. We ensure that we book good accommodations for your guests and keep them ready before they come in. We ensure that every single person in your guest list is attended to and no one has any trouble being a part of your big day. 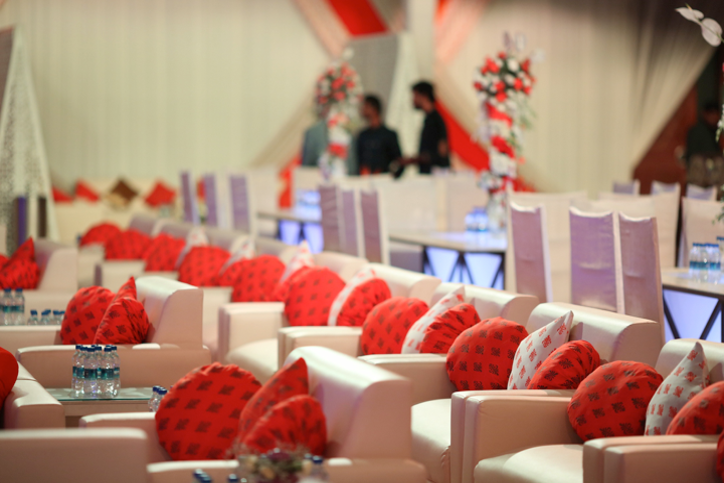 We understand the importance of your guests at your wedding and thus take all measures to make all of them feel at home. As of the meals and snacks, we co-ordinate with the hotels, inns and guest houses and arrange for various meals for the guests when they are not at the wedding. We are not just your wedding planner, along with everything else at your wedding we ensure that we take the responsibility of all aspects of it as our own. Hospitality being one of the key points in a wedding we consider it as high priority and ensure that your wedding goes smoothly without issues.